Amy, her husband and their two young daughters make their home on a New Hampshire homestead, where they raise chickens, ducks, rabbits, and a cow. 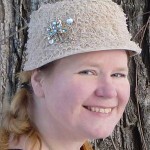 She enjoys making glass beads, sewing, foraging, and knitting. Amy's journey to a healthier, more sustainable, and enjoyable life began in 2002, and she's excited to share what she's learned here and on her blog What Did She Do Today.